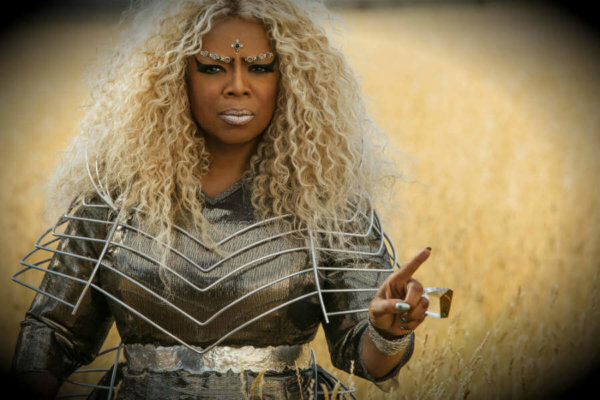 NEW YORK — Director Ava DuVernay’s youth-oriented fantasy film “A Wrinkle in Time” (Disney) wants to blow your mind. Whether it succeeds will largely depend on your reaction to the sight of a giant version of Oprah Winfrey who, as a celestial guide called Mrs. Which, dispenses New Age-style bromides while dressed in an outfit suitable for a Valkyrie and sporting a makeup job the late female impersonator Divine might have found a bit garish. As for more substantial considerations, this adaptation of Madeleine L’Engle’s Newbery Medal-winning 1962 novel for young adults is wholesome in some respects, problematic in others. While entirely free of the negative elements that usually debar recommendation for young viewers, the movie’s underlying worldview involves an uneasy combination of secularism and magical thinking. Standing in need of Mrs. Which’s help, and that of two of her peers, Mrs. Whatsit (Reese Witherspoon) and Mrs. Who (Mindy Kaling), is troubled middle-school student Meg Murry (Storm Reid). Four years after the unexplained disappearance of her father Alex (Chris Pine), a NASA scientist who, together with his physicist wife, Kate (Gugu Mbatha-Raw), had developed an unorthodox method of time and space travel, Meg is still devastated by his absence. So it comes as a pleasant surprise when the trio of women magi mysteriously manifest themselves to Meg, her adopted younger brother, Charles Wallace (Deric McCabe), an intellectual prodigy, and to her supportive would-be boyfriend Calvin (Levi Miller). With their otherworldly visitors’ assistance, the kids set off on a cosmic quest to track pop down and bring him home. Their journey is often eye-pleasing. From the start, however, Jennifer Lee and Jeff Stockwell’s screenplay tries to force or simply assume audience sympathy with the characters, rather than earning it. The picture’s ultimate message, that we should love ourselves even while acknowledging our faults, can be seen as promoting the Christian virtue of humility. And, though one scene incongruously suggests that Mrs. Whatsit, in the course of a shape-shift, engages in a bit of peek-a-boo exhibitionism, the youthful romance at the heart of the story is a model of innocence and positive, if not always convincing, emotional interaction. Still, very young viewers or for teens who are not well grounded in their faith may lack the discretion to retain the script’s acceptable takeaway while jettisoning the metaphysical gobbledygook that surrounds it. A follow-up discussion with parents may, however, help those in the latter group to do so. The film contains occasional peril and possible momentary off-screen immodesty. The Catholic News Service classification is A-II — adults and adolescents. The Motion Picture Association of America rating is PG — parental guidance suggested. Some material may not be suitable for children.